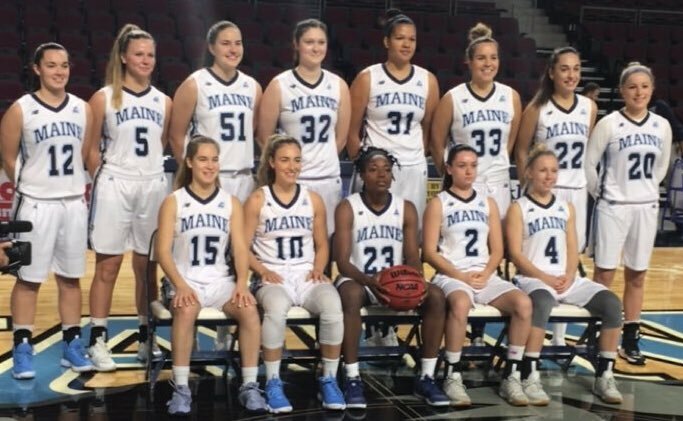 ORONO - On the heels of back-to-back appearances in the America East women's basketball championship game, the Maine Black Bears may have their work cut out for them. At least, that's how the rest of the conference views it. ...The women return three starters in AE All-Rookie Team selection Blanca Millan, who averaged 8.6 points, 2.9 rebounds and 2.6 assists a year ago, along with guard Tanesha Sutton (7.6 ppg, 4.8 rpg, 2.6 apg) and forward Fanny Wadling (5 ppg, 3.7 rpg). Freshman Julie Brosseau (6.8 ppg, 1.7 rpg) also saw significant minutes. UMaine must replace three-time, All-AE first-team guard Sigi Koizar (14.1 ppg, 4.5 rpg, 2.4 apg) and Laia Sole (9.4 ppg, 3.6 rpg), who was an All-Rookie team selection and the winner of the AE Sixth Player Award. Sole is one of five Black Bears who transferred after the season. Four of the five were freshmen. Interim head coach Amy Vachon has five newcomers on the roster and Parise Rossignol of Van Buren has returned to the team after leaving it following the 2015-2016 season. Does anyone know if Saturday's exhibition game against Stonehill will be streamed (or at least an audio broadcast by Don)? Can't make the game in person but would love to see how this year's team is shaping up. mainah57 wrote: Does anyone know if Saturday's exhibition game against Stonehill will be streamed (or at least an audio broadcast by Don)? mainah57: On the men's and women's schedules on goblackbears website it is not listed as of now to be broadcast or streamed for either Maine team. Usually, it is listed on that site if it is going to be streamed or broadcast live. However, it is only Monday so it could appear sometime between now and Friday if either game or both games are going to be streamed or broadcast. Remember these are only exhibition games. If not streamed then I will make my way to the Cross Insurance Center. Hope this helps as far as info goes. On the positive side, it seems that the first few regular season games are listed as being broadcast on ESPN3 (even the one vs. UMFK, which was surprising to me...). I've had generally good experiences with the ESPN3 platform for UMaine WBB game streaming (when I can't make it in person), so it's nice to see more and more games being available there. Downside is that it probably means less listeners for Don, but I'm sure there are still a few old school folks who will prefer the traditional audio over the ESPN3 streaming.